There are three different types of bone densitometers, so it’s wise to understand the benefits of each, so you know which one is right for your practice. The Pencil Beam DXA is the original method used for bone densitometers and is still an excellent choice. The image is produced by a singular beam of X-Ray. While you get very precise scans, the scans themselves take longer because it takes time for a single beam to scan the entire body. If your practice has lower traffic, like 10-15 patients per day, this type of densitometer is ideal. 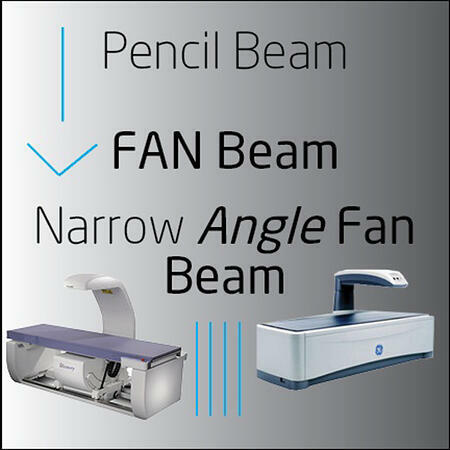 A newer bone densitometer is the Fan Beam DXA or wide angle fan beam. If your practice needs to scan a high volume of patients, it delivers much shorter scan times. That’s because the Fan Beam uses multiple X-Ray beams to scan the body at one time. However, there can be minimal image distortion because of the magnification of the tissue. The third type of bone densitometer is the Narrow Angle Fan Beam, which was developed by GE Healthcare for their Lunar Prodigy Line. It, too, uses multiple X-Ray beams across the body, but also makes multiple passes across the body to capture more images. The images are compiled, providing the super clear image quality of a Pencil Beam and the speed of a Fan Beam. Whether you have a low volume or high volume needs for DEXA scanning, there is a way to save money on the right scanner for you. It all starts by talking to an expert at Atlantis Worldwide. We offer Fan Beam, Pencil Beam DXA and Narrow Angle Fan Beam scanners that are preowned and refurbished. They have been restored to OEM specifications and come with impressive warranties and service contracts, so you can buy with confidence. Best of all, you’ll appreciate the significant savings combined with the high quality imaging you want for your practice. To find out more, contact Atlantis Worldwide today. When Should You Evaluate Your Mammography Equipment?